Tecma’s Employee Cafeteria Services are critical to the maintenance of the health, productivity and satisfaction of a company’s most valuable asset: its human resources. 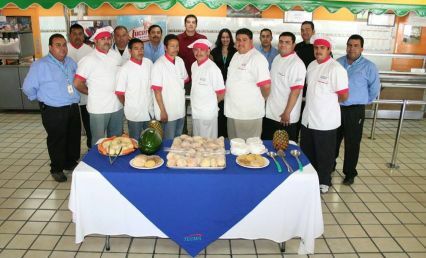 Tecma clients are able to provide professional cafeteria services to their employees. Serving over 14,000 meals per day. Cafeteria services offered by the Tecma Group of Companies maintains its high quality by choosing the best suppliers of inputs and holding them to the highest standards of excellence. This award is typically awarded only to the finest hotels and resorts of Mexico. Tecma is the only Mexico Shelter Services Provider to have won this award. In order to ensure the consistent and continued quality of its suppliers, Tecma Cafeteria Service personnel conduct periodic audits to ensure that the highest standards are met. You can trust Tecma’s professionals to care for the health and welfare of your firm’s employees in the area of food service. This service is available in facilities of Juarez, Mexico but currently are not provided as on-site meal services for Tijuana facilities.